I often forget that many of the people I interact with regularly have no idea I’m a grieving mom. Of course, this is ridiculous because the reason they don’t know is because I haven’t told them. Yet sometimes, I still feel like my pain is visible…like somehow, my grief over Maddie is carved into my skin, and strangers will look at me and just know. 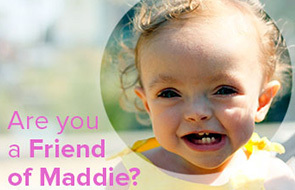 Last week, a coworker of mine found out about Maddie in a very sudden, very public way. She had no idea Maddie had died, and was completely blindsided. She then had to process this brand new information while she sat right next to me. She was shell-shocked and I felt terrible about it…I’d just assumed someone in the company had filled her in. The situation was entirely my doing. I very easily could have told her myself anytime in the last year. One of the reasons I don’t usually bring up Maddie is to avoid painful, awkward moments exactly like that one. Seeing my friend go through all of these emotions, knowing I was watching her, was just awful…and it was my fault. I found myself comforting her, assuring her that we were okay, that everything was okay. The words came out automatically, just like they did in the weeks and months after Maddie died. People would come to our house to comfort us, but I’d often find myself comforting them instead. I knew that people wanted us to be okay and so I’d compulsively tell them we’d be alright, even though I had no idea if we’d ever be okay again. I just I couldn’t bear their sadness on top of my own. Of course, now we are okay, even if it will never be okay that Maddie isn’t here. And even though this situation with my co-worker was an uncomfortable one, I’m not sure if it will change how and when (or if) I tell people about Maddie. It’s not that I don’t care about the feelings of my friends and acquaintances (I do, very much), it’s just that I have learned that I have to protect my own feelings. I’ve managed to put myself back together but there are days when it wouldn’t take much to break me apart. I keep reminding myself of this as the shattered look on my coworker’s face plays on repeat in my mind. This was a hard, uncomfortable moment for her, but this is my everyday reality and I’m still figuring out what I have to do to get through each day. I have a feeling I’ll be figuring it out for the rest of my life. P.S. How did Rigby’s vet visit go yesterday? Good, I hope! It did! The vet switched her to a different med that’s a little more aggressive, but it was an overall good appointment! I am very relieved! Oh Heather. In the weeks and months after Maddie died, I used to get to work early, read your posts first thing, and cry at my desk, every morning, all before anyone else had even arrived at the office. And I didn’t even know you personally, although I felt like I did. It’s always going to be hard for you and for others, no matter how and when they find out. At no point do you ever expect your co-workers to tell you they’ve experienced a loss like that. None of the alternatives are good. I feel for you, as this I know this is just one of the many, many hardships you face as a mom who has lost a child. I’m not sure if you’re a musical theatre fan, but even if you’re not, I’m sure you’ve heard of Hamilton on Broadway…it’s amazing…haven’t seen it but have listened to the soundtrack a bazillion times…well there’s a song called “It’s Quiet Uptown”…it is the song that comes after Hamilton’s son is killed in a duel…and the lyrics include “They are going through the unimaginable…” Every time I hear it I think of you guys and my other friends who have had to live through the loss of a child…many times I cry cause it’s a very powerful song… I’m not exactly sure how this relates to your post…maybe just to tell you even “strangers” think of you often and hope today is a good day. Both of my parents died when I was young and I’ve gone through something similar. It never seems like a good time to bring it up, so it comes up when someone is casually asking about holiday plans, or what your parents do, or something like that and it’s so awkward. I don’t have any advice, just sympathy. And know that it’s awkward for everyone. I’m sorry you had to go through that. It is very thoughtful of you to worry about other’s pain but I believe you have to protect yourself. You have the grief and pain, others can only imagine/emphathize. Wshing you peace and love. It’s not like it’s something that naturally comes up in conversation. Wouldn’t it be odd to be like, “Hi, nice to meet you, by the way my daughter died when she was 17 months old. How are you?”. I’m not trying to be callous here it just seems rather…I don’t know…strange to blurt out upon first meeting someone. It’s not a conversation starter. While I have had exactly this scenario happen to me a number of times since my son died seven years ago, I can also say that it does come up in natural conversation more often. When we meet new people asking if they have kids is just part of polite conversation. Of course we don’t introduce ourselves as “Trish, the one who lost a child,” but I find I have to decide quite often whether or not I will invest my energies by telling new people about my son. was this a friend you met after Maddie died? Or she was a friend before? not trying to “dig” but confused how she could not have known if she was a friend before? I feel that way sometimes. People find out my girls are adopted, which is a shock to them (they are twins, so people always ask me about being pregnant with them, or how i breastfed them). after they learn they are adopted, they quickly apologize, which i never understand that reaction. but then the questions start about why, etc. and we have a long, sad story before they came along, so i often skim over that part. i can’t take the sad faces. because “we are ok now! we got our girls! !” which, we are ok, but the pain never goes away. sometimes it dulls, sometimes it spirals back in full force. She’s a new co-worker of mine, I met her last year! Oh! that makes sense…I thought maybe you lost touch and she never heard until now. That is rough. That’s what I was thinking, too,Joelle. When I met my husband (25 yrs ago) he was widowed with a 5 year old and 2 year old twins. We got married 6 months later and I adopted his 3 children and 11 months later we had our 4th child. When asked how many kids I have – I always say, “I have 4.” I very rarely open with “but I adopted my husband’s 3 children.” So of course I get the usual questions of how how was it having twins? Did you breast feed them? Do twins run in your family? etc..etc. At that point I will usually tell them that the 3 older kids were actually my husband’s which always leads to – his wife passed away giving birth to the twins. I inevitably get the same reaction that you do. They are almost embarrassed that they asked and they start apologizing and giving me the sad, sideways face. They will then go overboard praising me for adopting “his” kids. I don’t want to be praised – I fell in love with them and their Daddy and don’t see them as anything but “our” kids. It gets awkward for me, as well as for them. I have learned through the years to treat each new acquaintance on an individual basis and what and when I tell them totally depends on what I feel comfortable with at the time. You are doing a great job and are 100% right that you have to protect your feelings. It is your story to tell when and if you want to. Thank you for your posts. You have helped me become a better listener and more aware of the awkward situations we sometimes accidently fall into. My husband died very suddenly 5 months ago. He was 45. I am finding myself in similar situations like this one during casual conversations. Like checking my daughter in for a medical appointment and trying to figure out the right words to say to have her Dad’s contact information removed from the emergency contacts. My son asks often what we say to people who knew his Dad in very casual situations, or do we not say anything at all. The lady he always bought tomatoes from at the farmer’s market, the owner of the French bakery he often went to, the plumber who came to repair a leak and who was looking for my husband when he got to our home. Sigh. I am sorry for your loss, Heather. I appreciate all that you share here and try to learn what I can from it. Thank you for your openness. Amy, I’m so sorry for the loss of your husband. Wishing you peace and love. Having to comfort or make others feel better or not feel awkward (not family but co workers and friends)is something that is very hard for me when dealing with the death of my dad. I always get angry in a way although I know I should not. Maybe because it is so new. I am sorry the interaction made you feel bad. Sending love. I talk about my brother all the time. I could talk about him all day. I don’t lead with, “Oh, he passed away” then keep talking. Eventually, it comes to that and I have to tell them then so see their face and the awkwardness. It’s too much. I relive their face but also those last moments with my brother. It’s tough. But, do I stop talking about B or keep talking? I chose, I keep talking. I never want people to forget his lovely face as well as the awful disease that robbed me of him. I got yo, Heather. Grief isn’t something we will ever finish. It’s just something we will live with for always. I experience this as well with new colleagues, weighing when (or whether) to tell them about my first baby… she just doesn’t come into conversation as easily as my two living girls. It’s never easy. And what you said about putting yourself together and protecting that because you could still fall apart so easily… It’s completely true. The shock and pity others feel, even when it comes from a place of genuine sympathy, is painful to witness when we’re still navigating grief on a daily basis in an effort to keep living meaningful and enjoyable lives. One thing I love about you and your blog is how you demonstrate that balance. You’re at a place where you enjoy making light saber party favors, yet you’ll never stop grieving Maddie, and her death will never, ever be okay. I hope that people who haven’t experienced this kind of grief can understand the way joy and sadness operate simultaneously in our lives without blotting each other out. thank you for that last line. I really needed that today.